Fifty Stephen F. Austin State University students attended the Texas American College of Sports Medicine annual meeting. The students presented research and participated in the quiz bowl competition. 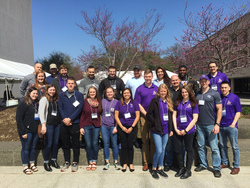 NACOGDOCHES, Texas - Stephen F. Austin State University was one of the most represented institutions at the Texas American College of Sports Medicine annual meeting with 50 students attending. SFA students from the Department of Kinesiology and Health Science presented research, networked with industry professionals and participated in a quiz bowl competition. Research by several SFA students was published in the conference proceedings by the International Journal of Exercise Science. Faculty members Drs. James Rowe and Dustin Joubert supervised the students' research. Drs. Eric Jones and Jeff Forsse also attended and helped organize the student trip. Seniors Caitlin Hogan of Wylie and David Buckley of Bullard and junior Zach Gin of Allen presented research at the meeting. Hogan, who was a finalist in the meeting's undergraduate poster competition, presented her study on the impact of aquatic exercise versus land treadmill exercise on ambulatory blood pressure. "It meant a lot to me to be able to present. It allowed me to develop professional skills necessary for my future career," Hogan said. "It was exciting seeing all of my hard work come to fruition and to see that others were interested in the work I did." Likewise, Buckley said discussing his research, which compared a variety of exercise tests to a person's maximum capacity of oxygen consumption, was the highlight of his trip. "Being able to present my research means so much to me," Buckley said. "I want to one day become an exercise physiology professor and do research, so this was a great opportunity for me to get my feet wet in the world of research." Gin's research, conducted with SFA student Jonus Rodriguez, focused on the validity and reliability of a cycle ergometer commonly used by coaches and athletes for exercise testing and training. Gin also participated in the quiz bowl that covered a variety of topics, including anatomy, physiology, nutrition, and exercise testing and prescription. "This was the first year I competed and represented the university, and I am excited to hopefully do it again next year," Gin said. "This was a fun way to test what I know about exercise physiology and compete against other universities in Texas."